Olympic Nordic Skiing! Extremely tough… technically demanding. The Vikings were the very first to use cross country skis. Long before Olympic Nordic skiing. Historical archives show evidence the Scandinavian warriors first used skis for hunting and transportation. Years ago Olympic Nordic skiing was actually one half of the overall skiing event during the Winter Olympic Games. In the late 1800’s the games were popular during the Norwegian Ski Festivals. During the 1924 Winter Olympic Games, alpine and nordic skiing events were separated. To-day Nordic or Cross country skiing is only one of the seven winter sport events that are contested. In 1952 the first women’s olympic nordic skiing event was held at the winter Olympic games in Oslo, Norway. The men’s olympic nordic skiing events: The short 1.5 km sprint, then the 15 km classical, 50 km freestyle team sprint; the combined pursuit , and finally the 4 x 10 km relay. Women’s olympic nordic skiing events: 1.5 km sprint, 10 km classical, then the 30 km freestyle, the team sprint; combined pursuit and the 4 x 5 km relay. There are two different styles of cross country skiing. Prior to the Olympics of 1988 this was the style for olympic nordic skiing. 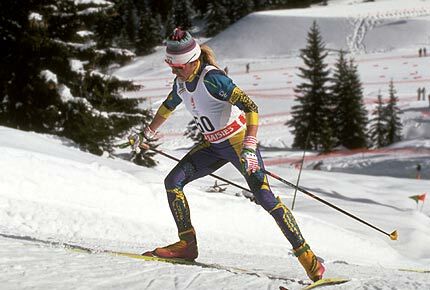 Resembling the ski exercise machines, the feet move forward and backward with a straight stride. The feet must stay in the track. The feet stay parallel to each other. The poles are used more often than freestyle skiing. 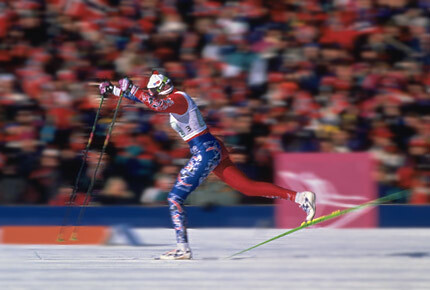 The waxing of the skis is extremely important in the classical as the power for each stride comes directly from the skier pushing against the snow. A much faster method of Olympic nordic skiing. The skier pushes off with the skies similar to skating. The foot is turned out at a sharp angle, carving into the snow as it slides outward. The other leg begins its turn to push as the weight is shifted. The skier must keep the backs of the skies clear of each other at they go back and forth. For those who have ice skated, you would find a close similarity to the freestyle Olympic nordic skiing technique. The sprint competition begins with a single elimination race. Sixteen skiers are grouped into four heats. The top two finishers of each heat go on and advance to the next heat. This continues until the group is down to four semi-finalists. They then compete for the three medals. The combined pursuit is a combination of a classical olympic nordic skiing race followed by a freestyle olympic nordic skiing race. The skiers' classical time, then determines the staggered start for the freestyle race. The gold medal goes to the first skier to cross the freestyle-race finish line. The second and third are awarded the other two medals. The relay race is fun to watch as the racers are going flat out. Instead of passing a baton as in track and field, the racers simply must touch one another. Norway, Russia and Italy have dominated cross country skiing over the years. The racing team is comprised of coaches, fitness trainers and equipment personnel. The equipment is very specialized. The skies are the wax-able, unlike recreational skies which are mostly fish scale or non wax-able. The waxing of skies is a science all on itself. The many types of wax must be selected with the temperature in mind. Even a one degree change may make a difference. Mixing grip waxes usually is required when a certain grip wax provides enough grip but the glide needs some work, or the glide may be good but the grip needs to be stronger. These two are really just versions of the same problem: one particular grip wax cannot seem to be satisfy your needs of olympic nordic skiing. Using the simple application, only one wax is used to make diagonal stripes on the ski base. With mixing, two waxes are used to make diagonal stripes. The waxes alternate the stripes. The amount of wax used with each set of stripes and two waxes is no more than when one wax is used. Remember, you want apply thin layers. Thin layers are much better. Once a set of wax stripes is applies you must cork very well. You are attempting to blend the waxes together. Repeat the waxing/corking cycle about three or four times. Try alternating the places where you apply the stripes to help blend the waxes. A good corking is not an option -- it is a must! The kick zone should look glossy with the wax evenly spread across the length and width to allow the athlete to compete in olympic nordic skiing events. You must let the skis and wax cool off outside before using them. This techniques of applying wax is used when snow has become much older. That is, the snow has transformed from sharp, fresh snowflakes to older, pellet-like snow due to working or machine grooming. A warmer wax is need to get a better grip, but the warmer wax is not releasing the snow, making the glide quite difficult. With this method the skis need to be kept and worked on cold so the two waxes don’t mix with each other. The warm wax is applied first and corked evenly. Then the cold wax is applied in strips and corked. The trick is to not cork too strongly or the waxes will mix together. Let the wax cool off before trying. If you are still getting clumping, apply one or two thin coats of colder wax, to satisfy the technical requirements of olympic nordic skiing. Anyone who has ever touched Klister wax is left with bad memories. We have had some bad experiences with it. However the people who must use it have certain methods to follow to apply it without making a mess. Klister is for when the snow is too warm for hard wax or when the track is glazed over. First you must apply a layer of Klister and let it cool. Then you must apply a coat of cold wax. The hard part is to get the cold wax to stick to the Klister. Often there will be more wax on your hands, tube and table than on the skis. The trick is to have your cold wax warmer (softer) and the klister harder. To begin, you need the skis with the Klister on them as cold as possible. Better outside is possible. The grip wax should be close to melting but not melting. Warm it up with a hair dryer, or keep it near a heater. Spread a thin layer over the Klister. Lightly cork it but don’t mix the two waxes. After it cools, apply a couple of more coats of the warmed up wax again corking lightly. You want the cold wax over the Klister to be effective in olympic nordic skiing. Another method takes a little more preparation and should be done a few days in advance. First apply the Klister. After it cools down, take the hard wax you are going to use and melt some in a pan or tin. Apply a thin layer of this wax on top of the Klister with a brush. The aim is to apply in thin layers. Get the skis cooled off and then polish it lightly with a very light touch. WHISTLER, B.C. — It was a warm summer day but Olympic medalist Pierre Lueders was already thinking ahead to the 2010 Winter Games as he cast an expert eye over the nearly completed bobsled track that unfolded like a ribbon through the green forest. "It's going to be really fun to drive," Lueders, the Edmonton-born pilot who won a silver medal in the two-man bobsled at the 2006 Games, said Thursday. "This certainly has some characteristics that are very uncommon, that we haven't seen before. It will make it very challenging. "The Vancouver Games are just under three years away but by Christmas all the competition venues in Whistler will be completed. The alpine resort, 120 kilometers north of Vancouver, will host the Olympic Nordic skiing events, Alpine skiing, ski jumping, bobsled, luge and skeleton events. While Lueders talked about the tingle of excitement he's already feeling, John Furlong, chief executive officer of the Vancouver Olympic Games Organizing Committee (VANOC) spoke of the relief of fulfilling the promise of getting the venues finished on time and on budget. "You think back to when this project was just lines on paper," said Furlong as he looked around the former garbage dump that is being transformed into the athletes village. "It sort of puts a chill up your spine to see how much is done." VANOC is spending $252.2 million on venues in Whistler. The total venue budget for the Games is $580 million in taxpayers money.A VANOC tour of the venues shows the progress that has been made in just the last year. At the $119.7-million Olympic Nordic Skiing venue, a construction crane working on installing the ski jumps peeked over the top of trees like a bird out of a nest. The facility, nestled among snow-covered mountains, will also host cross-country skiing, biathlon and Olympic Nordic skiing combined. "We're taking three events and putting them in one venue," John Aalberg, the venue's director of sports, said as he swatted to keep a squadron of hungry mosquitoes away. "I think that's the first time in Olympic history that has happened." The facility, at the end of long, winding road about 20 kilometers from Whistler, covers one square kilometer of space. Within that area will be 15 kilometers of competition trails carved out of thick forest. "I've spent some quality time with most of the trees around here," joked Aalberg, who skied at two Olympic nordic skiing events for the USA. The $104.9-million Whistler Sliding Centre is being carved into Blackcomb Mountain. Over 100 kilometers of pipe will keep the 1,700-metres of concrete sliding track frozen. Watching the construction was a new experience for Lueders, a gold medalist at the 1998 Nagano Games. "I've never seen a track being built," he said. "That's pretty neat seeing how a track goes from being a side of a mountain to all of a sudden there is ice on there and we are sliding down. "Having the track completed early will give Canadian crews a huge advantage. "We will have more runs than anybody else," said Lueders, who combines a fiery competitive edge with thoughtful insights into the sport. "That will be a key. "You know the track inside out. You know the problems, the easy part, the trickier points. You know where you can lose time or make up time. That's the whole idea of having home-track advantage." At the future home of the athletes village, a black bear strolled unconcerned over the trucks and graders working. VANOC is contributing $37.5 million toward the building, which will be home to 27,500 athletes and officials during the Games. The resort of Whistler is picking up the remainder of the $131-million project and will use the facility for affordable housing after the Olympics. It is expected to be completed by 2010.Over at alpine skiing, a piece of heavy equipment and some portable toilets sat in the finish area. But by February the hill will host the Canadian championships and a pair of World Cup ski events. Peter Bosinger, the venue's sport manager, said the $27.6 million spend on improving the downhill course will make it into an Olympic classic. "It will be one of the best and I believe one of the most exciting courses that an Olympic Games has been seen on," said Bosinger, who skied for Canada at the 1988 Calgary Games. "You have the speed, the terrain, the jumps. The women's course, will be one of the most technical races the women have ever run. I think we've been able to capture the natural terrain that is existing on the mountain."